Members of the 13th Marine Expeditionary Unit from Camp Pendleton, Calif., joined Japanese Ground Self-Defense Forces for this year’s “Iron Fist” exercise, held in Southern California. The three-week interoperability training exercise has the combined forces training on this side of the Pacific along the coast, in the desert, out at sea and back ashore as the Marines and soldiers hone their warfighting skills with patrolling, assaults, mechanized attacks and live-fire and maneuver drills. This is the eighth year for the bilateral training, which “promises to be bigger and better than in previous years,” Maj. Gen. Melvin G. Spiese, the I Marine Expeditionary Force deputy commander, said during the Jan. 22 opening ceremony. So this year, the combined force is training in several different places. They trained at the vast Marine Corps Air-Ground Combat Center, located in the Mojave Desert outside Twentynine Palms, for about a week. 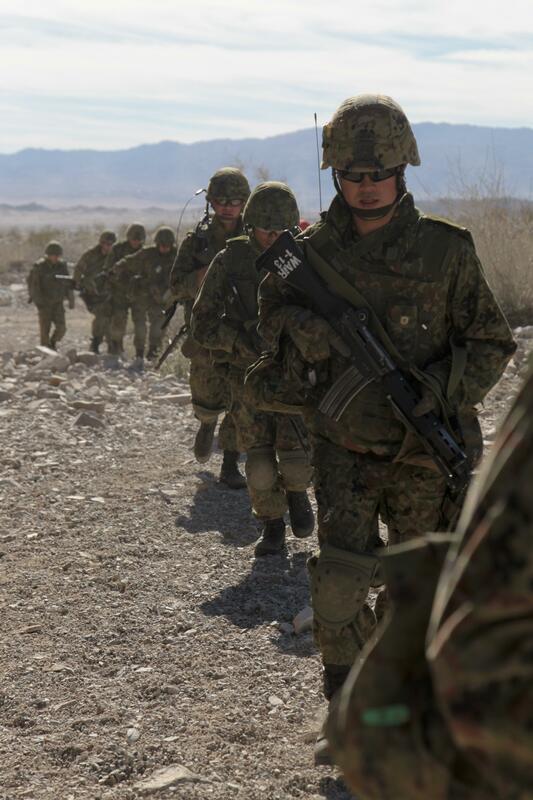 Japanese soldiers joined Marines from Bravo Company, 1st Battalion, 4th Marines, an infantry battalion that is serving as the ground combat element for the 13th MEU, which is scheduled to deploy later this year to the western Pacific and Persian Gulf regions. The feelings were mutual as the forces practiced platoon- and company-level tactics. “When I look at their soldiers and my Marines, they are every bit as proficient in the tactics that they do, just as mine are at theirs,” said Bravo Company’s commander, Capt. Brian J. Marthiljohni of Celina, Texas. The exercise, which began Jan. 22, continues this week with amphibious training at Camp Pendleton and on San Clemente Island, an offshore live-fire training range. There, the force will practice assaults and naval gunfire support before a final field exercise in mid-February and amphibious landing at Camp Pendleton’s Red Beach from amphibious assault ship Boxer.